Composed by Traditional German Carol. Arranged by Anna Luther. Christian, Christmas. Score, Set of Parts. 8 pages. Published by Anna Luther (S0.457353). 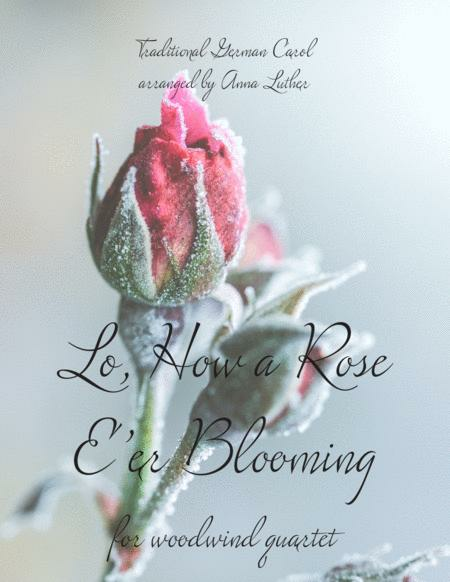 This arrangement of "Lo, How a Rose E'er Blooming" sets the traditional carol for woodwind quartet (flute, oboe, clarinet, bassoon). Arranged to be easily accessible to early intermediate players in schools and churches alike, the arrangement stays true to the original carol with limited original writing added to highlight the unique timbres of a woodwind quartet. The arrangement is approximately 1:30, perfect for a short interlude and easily repeatable to provide more material. Learn more about Anna Luther's work on her website, www.annaluther.net; her Facebook page, https://www.facebook.com/flutist.anna/; or her on Instagram as @flutist.anna.